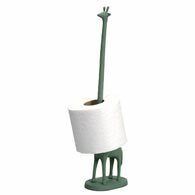 Our handcrafted giraffe paper holder is a whimsical and attractive accessory for storing and presenting your toilet paper or paper towels. This giraffe's long neck will deliver paper wherever you need it. Holds two rolls of toilet paper or one roll of paper towels. Decorative, functional, and fun. 16" high.